The New Spam: Hello – How Are You? This is a test for sure. But what’s being tested? I have no clue. Right now my email spam folder has nine emails unlike all the others. Though each claims to be from a different sender they’re all exactly alike. The subject is “hello” and the body is “how are you?” That’s it. Like most spam its lineage is questionable. All the addresses are forgeries. I opened a few to check the routing information. The first originated in Brazil. Another came from India. I suspect each of these spams comes from a different source. More than likely this is a botnet at work. Someone has gone to a lot of trouble, but why? Seriously–this spam accomplishes nothing. There is no ad nor any payload (like a virus). Because most of the addressing info is forged these spams can’t report back on what they find. These “hello – how are you?” messages are one of two coordinated spam waves I’m currently seeing. The other contains snippets from various news stories run together into a large paragraph of unrelated sentences! Again it’s totally worthless to the spammer with no useful payload though it certainly requires a lot of resources. Are you getting these to? I’d like to know. Because so many of you are curious I’m including the source from one after the jump. 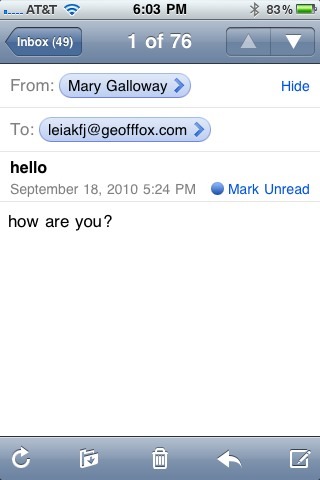 The email was sent to a seemingly random, non-existent mailbox at geofffox.com. As with all my email it is then forwarded to a catch all box at Gmail. I have not received any yet, Geoff. But my e-mail filter program would catch it before it got to my mailbox. I gave up wondering about spam years ago, but I love reading your posts about it. you do the wondering so I don’t have to. Nothing in any of my accounts. Just a notice about three new women who may want to meet me, and someone who wants to give me a great deal on Viagra. Wonder if the two are working together? I was wondering if I was the only one, I have like 200’s of those messages. I think they want to find people that need attention a lot, and so, would be more likely to answer an email like that. Kenneth: Obrigado por visitar meu site! The problem is the return addresses are also bogus. It’s a real puzzle. I’ve been seeing dozens of these all day as well (a few got through Gmail’s filter). I figured they were fishing for replies to store valid email addresses for a follow-up scam, but seeing as how you’ve found the returns bogus as well… I’m baffled. Yes, I received about 4 of these today. Perhaps they are trying to bait you. Honestly if I had seen this email before reading your post, I would have replied with “Im well, do I know you.” At that point they might send another email with a link or sell my account to other spammers looking for live accounts. I haven’t been recieving spam like that, but I have noticed lately that more crap is making it past Gmail’s normally excellent spam filters. Have you experienced that too? This has gotten past Gmail sometimes along with the other spam I mentioned (non related news clips forming a very long, dense paragraph). Josh – AFAIK every address is forged so there is no way the sender could gain access to the returned/replied email. I just checked Gmail’s spam folder…. Mostly just the usual phishing scams and people wanting to sell me pills for…uh…yeah…anyway…. Have you looked at the *source* of the e-mail? Is it HTML or Plain Text…and if it’s HTML, does it have any embedded images in it? They could be using images and an identifier or something that’s sent back to the remote server to determine whether your email address is legit or not. I have received this sort of spam for several years. Never that often or in great volume. I have always wondered what the purpose was. Generally an e-mail with a subject line like “Hello” coming from an unknown address is deleted unopened. I have had about three of these “hello” messages daily, with no motive visible, from different people and e-mail addresses, all caught by my GMail (for Google Apps) Spam Filter. However, this morning, I received about 15 of those e-mails, from different people, and two managed to get through the filter. A bit concerned that they’ll all be in my inbox soon!! I wonder what they’re up to…. I have had about twenty of these so far today, all going into one e-mail account (the one published on the web). Haven’t seen them on any other, so the work spam filter (only other published account) is at least functional. Why indeed? Testing a spam distribution system in preparation for sending out something more nefarious? Have also received shed loads of these exact emails. Some of which are sneaking past gmail’s spam filter. Definitely an unusually large number of this message so is a concerted ‘campaign’. Found the same as you in terms of fake-ness of sources and lack of anything traceable in the message. My assumption is that they’re gathering data about the interaction with the SMTP servers they’re hitting. Many servers will reject invalid sender or receiver addresses synchronously (during the send operation), and maybe SPF failures might show up at that stage too? @Geoff : I’ve recieved hundreds of those mails and started questioning my self just as you did. Then I googled “new spam “how are you?” ” and your page showed as 1st result. I’ve had loads of these and Gmail plants them in my priority inbox, presumably due to the benign content. I’m guessing that the spammers are trying to train our spam filters to believe the messages that follow are not spam. Someone shoot these morons whatever they’re doing it for. Had several similar mails on several addresses (different domains). Traced back only a few, all different countries. I’ve gotten about a dozen of these over the last few days and have responded by sending them my social security number and my mother’s maiden name. Just checked my junk email file and what do you know there are two of them there. I have received more than 150 of these spam-mails. On Twitter there are many people asking the same questions as you are. Yep also got them. 34 as of yet. I started receiving those mails yesterday and up to now, about a hundred have landed in various of my inboxes. I agree with your assumption, there is something non-obvious going on here. Did you find out something about the X-Mras header? Which server/firewall/relay produces it? Also: Some of the emails are sent to a non-existant mailbox (i.e. 88c23b226b52@domain.org) which, like in your case, is forwarded to my gmail catch-all account. However, some of them are sent to legitimate mailboxes (contact@domain.com and even the correct firstname.lastname@domain.com). In all cases, the actual To: header is forged, though. I have also received quite a few of these. Because of the benign content, these sail through my spam server (Barracuda). If anybody figures out what they are, I’d love to know. RFC 822 allows for using X- prefix for user generated info. I have no idea what the “X-Mras: Ok” header means, but it seems to only show up in these emails. I created a filter to send any email containing “X-Mras” anywhere in the headers to a special folder. So far the only emails that show up there are these odd “Hello – how are you” type emails. This sort of email has been showing up for at least 2 years, off and on –the “X-Mras” field seems consistent in all cases (this may change). As pure speculation I think it may be an experiment with Bayesian auto learn features in some anti spam systems. Teach it any “X-Mras” token is ‘ham’. But that’s just a wild thought, as nothing else seems to come to mind. Well possibly some DNS hack, but that seems a slim possibility… maybe. If anyone knows where the “X-Mras” header originates, or what it means, I’d like to know. All I can say for sure it so far the only emails my filter has caught are these odd ones under discussion here. Thanks for setting up this site, Goff Fox. Perhaps others would try doing the same filter and see if they catch any false positives and report back if they do (or don’t for that matter). I’d like to set it to just delete these –if in fact the “X-Mras” header is only associated with these emails (again, so far, it’s worked 100% for me). I have three of these. As others have suggested, could the sender be using the idea of emails that don’t get bounced back went to a legitimate address? That would give them a list of valid email addresses. Would that be valuable? I’ve received a few dozen of these tagged by our campus filter with 1/4 spam ‘#’ – so my filter currently shows them to me. Me too ! I’ve received 30 spams “hello, how are you” all different.. If this continues, I plan on contacting my grad school tech dept to see if they can do something about it. Something similar happened a few years back (also through my grad school .edu account). Tech support mentioned that the anti-spam software/filters had to be upgraded. Yes, I’ve received a flood of these emails to my personal domain this weekend. First a torrent to an alias I no longer use so disabled that, then later a batch to my regular address. This morning I arrived back at work to discover various people, typically those at director level, also received hundreds between them! Quite an offensive attack. I have been received at least 20 of these all weekend. But today i have been receiving e-mails from random people with the header ‘report’ and saying ‘Sending my report. Have a great weekend. It then has an attachment. Any ideas how i can block them? Richard, I believe that email is probably an ‘ordinary’ spam / virus. These ‘hello’ emails are fairly unique in their sparseness, frequency and volume, and the suddeness with which they started and stopped. do you want to see my pic? Nothing else in the body at all. As per the others, this was relayed through what’s probably an ISP’s relay, but crucially now invites a response. I wonder if the attack is beginning again, or this is another ‘regular’ spam? Interesting! I’ve gotten 100’s of undeliverable mail for something I never sent. I think to do with pharmaceuticals. It was a widespread virus. I updated Macafee and it’s gone. Every week I get a message that the scan was clean but it obviously wasn’t. Hey Jeff. Are we going to lose our tomatoes tonight? We’re in a low spot in Woodbridge and always get the first frost. I think it is the most likely explanation of this type of email. My SMTP server rejects all connection attempts from IP’s located in Russia, China and all of South and Central America. – The body was simply – how are you? – The header contained a second Received: line that contained a port=nnnn and helo=(string) parameter (which I believe is indicative of Exim software). Googleapps for my domain dont filter these, so they income. I report them to googleapps but actually they continue to income. I think I’m going to set à filter to automaticaly send them to trashcan . I have received some as well. No one has really mentioned the from addresses they are getting them from. Is it possible that the accounts are bogus but they do forward to a catchall. As many of us have them setup. Another thought is that the test is to see the population this receives online as well as harvesting information that way. Someone could be trying out some new code technique and we are all obliging them with information on how well it is working. I get one or two a week and glad to know it’s just a test. My only suggestion is never reply back. I think that’s what they are testing. maybe some string of events that will allow you to accept something if you type “who is this” or Great you or some other variable. that’s was my only thought! I and several people on my school’s staff are getting these. We have a fairly secure server that uses Symantec’s enterprise level spam blocker, but these are nor screened. They are definitely weird. I too am receiving the “Hello” emails. All it has is “Hello” as a message subject (or “Hi”, “Hey”, etc.) and the body says “Hello” as well. There are no attachments. These are coming into my work email repeatedly and has been for a couple of weeks now. I just delete them but am starting to wonder what is going on here. Personally, I believe it is a phishing scam. If you reply, then you get bombarded with spam emails, so that’s why I don’t respond to them. Of course, I am not an IT person, but it’s just common sense. I just receive this e-mail which forwarded automatically to all my contacts and someone from Colombia (according to google) opened my account and changed my password. if anyone have any relation information according to this issue where they account get literally attacked who should anyone inform? I got at least a hundred emails today almost all in Russian. I took Russian 38 years ago in college but I don’t now what these say. I just recognize the alphabet. The few in English are all for Viagra etc. For a while they were coming in as fast as I could delete them. I’ve been at work the past 9 hours so I don’t know if they stopped yet. are you getting these again? x-mras header is added by some Russian mail services, ironically as the result of a spam check. Take this one to the bank. I paid a web master. I do mean control it. Goverment take over of the www.